Apple is expected to release the next version of its mobile operating system, iOS 9, this month, with a beta version enabling ad-blocking and deep linking in apps. Both suggest Apple is prioritising user retention over user acquisition on mobile. Deep linking will allow iPhone users to search for content inside apps, like documents from Microsoft’s OneDrive, recipes or events from calendar apps. Deep linking is the ability to link to specific sections inside an app – like a Google for your installed apps. The idea is to make it easier for an iPhone user to reach the relevant section of an app, and to return to their search results via the back button. For example, a user may be interested in finding a potato recipe, but doesn’t necessarily want to open multiple recipe apps on their phone. Using Spotlight, the user can pull up potato-based recipes from, say, the Yummly app, and another app without actually opening either. Alternatively, searching for a destination, like ‘London’, might bring up flights from the Kayak app, or accommodation from a hotel app. While Apple isn’t the only company to introduce deep linking – Facebook and Google have similar functionality – its unified ecosystem makes the change significant. While Android might have a bigger installed base, it’s iPhone users who use apps more consistently. Apple is encouraging developers not to "over-index" content, and will prioritise results that users actually click on. This is how the firm is hoping to avoid Google’s historical issues of spam and irrelevant results. Apple’s deep linking doesn’t necessarily spell the death of Google as the primary search tool, but the changes are a mark of intent, according to Emma Crowe, senior vice president of client strategy at Somo. It also means marketers will have to think about making content within their apps more relevant and less salesy. She said: "This is much more behavioural from a marketing perspective, and really drives that frequency of behaviour. "It’s less focus on acquisition, and I’m not sure businesses are really up to the market on this. They are still focused on click-and-collect, or pushing users to download an app." One disadvantage is that iOS users don’t necessarily know Spotlight exists, nor understand its capabilities. 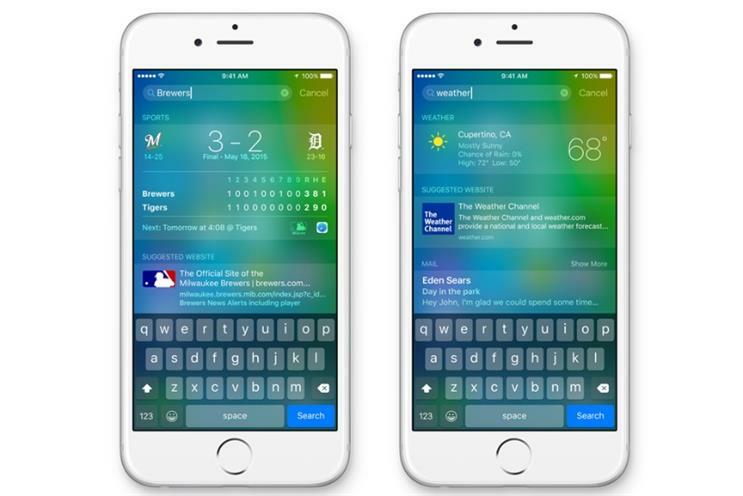 To that end, Apple has launched a redesigned Spotlight search page for iOS 9 which puts Siri front and centre. The new iOS update will let Safari extension developers block certain types of content – cookies, images, pop-ups – from displaying on Apple’s mobile web browser. Users who download the content blockers would, in theory, have a cleaner, faster, mobile web experience unpolluted by ads and trackers. As such, the new facility isn’t actually targeting ads, just unnecessary code that sits on top of web pages. Unfortunately for advertisers, that generally means ads. That’s led some to pronounce the death of mobile advertising. The first ad blockers for Safari on iOS 9 are only just emerging, making it difficult to predict the impact on publishers. Some ads can’t be blocked – the new functionality won’t affect native ads, for example, or pre-roll video ads. For Somo’s Crowe, ad-blocking will also be limited by low user awareness, but will nonetheless force marketers to move on from banner ads. She said: "There will be an impact, but I don’t think users are that aware of [iOS ad-blocking] yet. What the media business could do is not allow access unless ads are permitted. "They could move beyond banner ads towards more integrated video, and that would have better ROI in the long run."